LATEST SAT TEX....Tapio still has PROBLEMS can't keep his engine running and solar pannels stil not working...Coconut is singing??? ARE had visitors onboard..and enjoy decodeing ISTVAN.. #GGR2018. Gregor McGuckin 22TIRING DAY BUT GOT UP MAST AND RAN NEW HALYARD.BACK ON TRACK! Susie Goodall 73-IN NEED OF A GOOD WALK! Mark Sinclair 88 EQUATOR ASTERN - NEXT WAYPOINTS TRINDADE & TRISTAN DA CUNHA. With the passage of Ecuador yesterday from abhilash tomy and this night of loic lepage, there are only two boats of the golden globe race 2018 in the northern hemisphere. Mark Sinclair is only 300 miles away from the symbolic line while itsván and, who finally fired south west, is still just over 300 miles... in Chichester Category, Antoine Cousot is He is 450 miles away but can be satisfied with catching up and beyond the virtual wake of the winner of the original race sir Robin Knox Johnston. A satisfaction that is added to that of finally touching the South-East trade winds that mark the end of the pot to the black. In Front, the fleet runs south, almost wind through a alizé that turns slightly west as boats progress. Uku Randmaa, 3th always leads the platoon, followed by a little less than 30 miles by Susie Goodall, a little more off the direct road in his west. Are Wiig, 6th, displays the most beautiful progression with 143 miles swallowed in the last 24 hours and ahead tapio lethinen of about 143 miles, embarrassed this morning by energy problems (Solar Panels, engine, hydrogénérateur ). 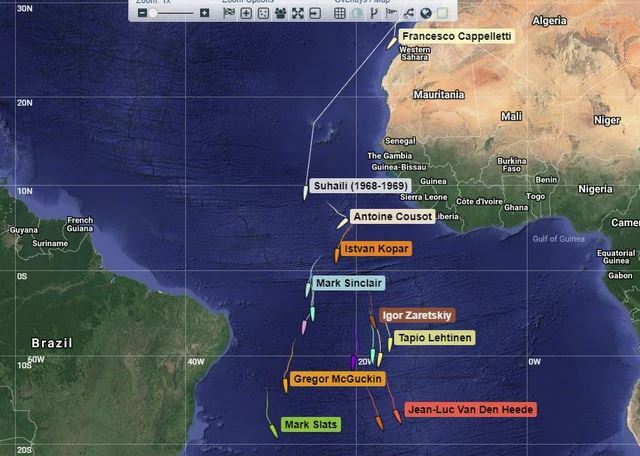 At the head of the race for 3 days, Jean-Luc van den heede continues his descent towards the cape of good hope. Philippe Fishing, a little more west, is only 20 miles in his back table and gradually reduces his lateral gap. The next few days will make it possible to draw the first balance sheets of Mark Slats's western options (9th) and Gregor Mcguckin (8th), gone around the anticyclone of st. Helena who usually bar the direct road to the point South Africa. However, in contrast to fast racing boats (such as imoca 60), the heavy sailing boats of the 2018 do not show large differences in speed depending on the way and force of the wind, which could allow Who took the risk of passing through the east, if they were slow, to stay ahead of the first cape of this world tour... and to open the way to the great south and its legendary storms.